Invent the boomstick, save the world! While developing their skills as inventors and engineers, some tinkers invariably feel the pull to totally different realms of thought, just to mix things up a bit. Other tinkers really don't find this to be unusual at all; in fact, most are so busy with their own little obsessions to really bat an eye at another tinker's source of amusement. Some find themselves drawn to the classic motif of the man at arms; however, rather than honing the art of combat to an instinct, the innovator turns it into a science. Upon beginning the process of translating the idea of combat specialist into something he can understand, the innovator comes to the conclusion that besting those who have been combat specialists their entire lives would be facilitated by confusing them. To achieve this, the innovator starts with one of the most complicated weapons available and starts making it completely incomprehensible to anyone but himself. 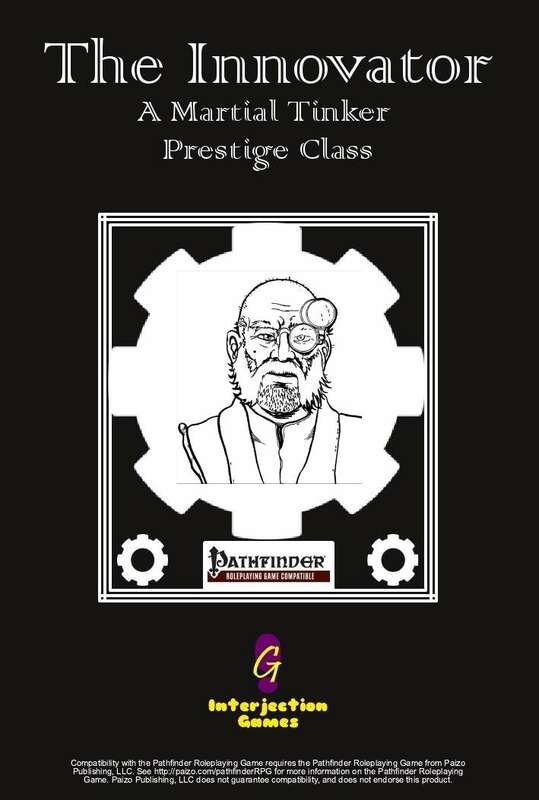 The first in a series of prestige classes released every 50 sales of The Tinker: Master of Modular Mechanical Mayhem, The Innovator: A Martial Tinker Prestige Class focuses on getting the tinker out of the back and into the front lines where any self-respecting squad commander will be. An innovator's signature ability is the acquisition and customization of a signature weapon. Starting off as a standard exotic weapon, the innovator makes five "breakthroughs" over the course of his career, adding robotic arms, an automated mortar, wand slots, flamethrowers, or really sparkly glitter to his weapon. These abilities are contained in three tiered trees: alchemical, construct, and magic. Each time the innovator receives a breakthrough, he can select the lowest remaining tier in one of the three trees, allowing for dozens of possible designs. The following are examples of breakthroughs. Tier 3 - Integrated Lobtube (Ex): A hopper with the storage capacity to hold five flasks, tanglefoot bags, smokesticks, or other similarly sized alchemical goods now hangs from the innovator's back. A thick hose runs from the hopper to a hollow cylinder attached to the innovator's signature weapon. Once per round using its own action, a signature weapon with the integrated lobtube breakthrough can launch a single object held in the hopper at a creature within 60 feet. Treat this as a ranged attack made by the innovator using his signature weapon. If the signature weapon is a melee weapon, treat it as a non-improvised ranged weapon for the purpose of this breakthrough. If the attack hits, it deals 1d4 points of bludgeoning damage and the alchemical good activates. If the attack misses, the alchemical good scatters 1d4 x 5 feet in a random direction and activates where it lands. Reloading the hopper is a standard action for each item added to it that benefits from the Rapid Reload feat. Should the innovator's signature weapon ever leave the radius of his master's presence class feature, the lobtube ceases to function. Tier 1 - Mounted Mini-Crossbow (Ex): The innovator mounts a small crossbow on his signature weapon. Whenever the innovator deals damage to a creature within 30 feet of the innovator with his signature weapon, the crossbow fires, dealing an additional 1d4 points of piercing damage. The crossbow reloads automatically, but only does so at the beginning of the innovator's turn. I bet the "unlicing" typo was supposed to be "unliving" - still an odd word-choice over the more standard "undead."